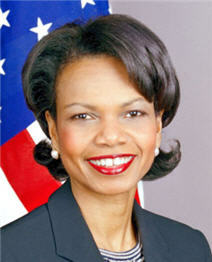 U.S. Secretary of State Condoleezza Rice is headed to Africa next week to discuss regional peace and security. From Washington, VOA's Margaret Besheer has a preview of her trip. Secretary Rice will arrive in the Ethiopian capital, Addis Ababa, for a one-day stop on Wednesday. During her visit she will meet with regional heads of state and ministers to discuss the African Great Lakes, Sudan and Somalia. Assistant Secretary of State for African Affairs Jendayi Frazer says the meeting on Somalia will include that country's president and new prime minister, as well as ministers from Uganda, Djibouti, Ethiopia, Sudan and possibly Kenya, as well as the African Union chairman and the U.N. Special Representative for Somalia. "We are hoping the consultation will focus on how to achieve a more inclusive political dialogue and reconciliation to move the country toward 2009 elections; how to mitigate the impact of the current violence, especially in Mogadishu on the civilian population and address the humanitarian emergency; working together to further isolate extremists and spoilers who continue to use violence; and then to push for quicker deployment of the African Union force into Somalia - the AMISOM force," said Jendayi Frazer. The secretary's meeting on Sudan will aim to continue the U.S. focus on the implementation of the Comprehensive Peace Agreement (CPA) signed between the Sudanese government and the Sudan's People's Liberation Movement (SPLM) in 2005. "We want to consult on how to move the process forward or to get the CPA back on track," said Frazer. The SPLM withdrew from the unity government last month, saying the Sudanese government had not been implementing the peace agreement that ended Sudan's two-decade long north-south civil war. While in Addis Ababa, Secretary Rice will also hold bilateral meetings with the Ethiopian government. Following her stop in Africa, the Secretary will travel to Brussels for a NATO foreign ministers meeting on Thursday.